The Anxiety & Stress Management Institute offers a variety of services for mental health professionals practicing both in the Atlanta area and around the United States. These services include a wide range of continuing education workshops for psychologists, professional counselors, social workers, and marriage & family therapists as well as a 60-hour hypnotherapy training program that meets the requirements for certfication in clinical hypnotherapy by the National Board of Certified Clinical Hypnotherapists (NBCCH). 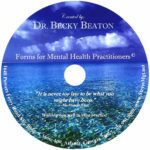 Additional services for mental health professionals include professional supervision and business consultation with Dr. Becky Beaton, the Founder and Clinical Director of The Anxiety & Stress Management Institute, as well as a wide array of professional forms designed specifically for mental health professionals to use in their everyday practice.